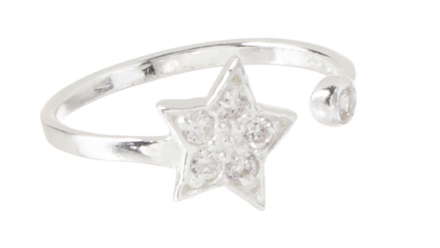 Sterling Silver & Clear Crystal Star Toe Ring Only $9.99! You are here: Home / Great Deals / Sterling Silver & Clear Crystal Star Toe Ring Only $9.99! During the warmer months it’s nice to minimalize what you are wearing. But you don’t want to minimalize your look! This Sterling Silver & Clear Crystal Star Toe Ring for Only $9.99 will create a little sparkle to catch everyone’s eye!